Two researchers at the University of Wisconsin in Madison have discovered a novel way to generate enough energy from walking to keep small electronic devices powered. The researchers, Tom Krupenkin and J. Ashley Taylor, use an energy harvesting technology called "reverse electrowetting" that converts mechanical energy into electrical energy. Electrowetting is a process that can be used to convert electrical energy into mechanical energy. Krupenkin and Taylor found a way to reverse that process and turn mechanical energy into electrical energy by using a microfluidic device made up of thousands of liquid micro-droplets interacting with a novel nano-structured substrate. The clunky leg brace produced five watts of power — enough to power 10 cellphones. Methods to charge small devices by walking have been around for years, but they've been impractical. 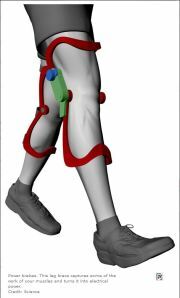 In 2008, for example, researchers developed a clunky leg brace to produce five watts of power — enough to power 10 cellphones. To make more practical kinetic solutions, generators need to be smaller. The problem with that is shrinking a generator also shrinks its power output. "Energy harvesting is a very old idea arguably going back to the invention of the windmill, sail and waterwheel," Krupenkin and Taylor wrote in a paper appearing in Nature Communications. "The harvesting of environmental mechanical energy is particularly promising for portable applications by using such high-power sources as human locomotion, but currently its use is substantially limited by low power output of energy converters," they explained. That need not be the case, though, with a harvester based on the pair's design. It could capture the energy generated by walking, which usually escapes as heat, into as much as 20 watts of electrical power that could be used to provide juice for mobile devices. What's more, the harvester never has to be recharged because it constantly produces energy as a person is walking. According to the University of Wisconsin, Krupenkin and Taylor were inspired to work on the power problem by the existing challenges posed to mobile devices by dependence on battery power. Among those challenges is the need to charge batteries in off-the-grid settings. For example, wall outlets aren't always available for military and law enforcement personnel. In fact, combat soldiers carry as much as 20 pounds of batteries into the field to power their communications gear, night-vision goggles and computers. While the pair's harvester could be used to directly power devices, such as smartphones, radios, laptops, GPS units and flashlights, it could also be integrated into a WiFi hotspot and serve as an intermediary between devices using the network and the network itself. The advantage of that is the device can reap the energy benefits from the harvester without the harvester being attached to the operator of the device. According to the researchers, that configuration dramatically reduces power consumption of wireless mobile devices and allows them to operate for a much longer time without a battery recharge.